Good health and nutrition seems to escape many of us, and this is complicated by what we understand to be the ideal “diet”. We are constantly bombarded with diet books, magazine articles, other media, and friends and relatives who claim to have discovered the latest diet “guru” or “diet plan” that offers all the right solutions for all our nutritional woes. Many of the same solutions are offered in different packages and have been tried again and again. Dietary programs span a spectrum from; 3 day detox solutions, to food combining regimes, raw food diets, high protein diets, fat free programs, Calorie counting, measuring and weighing food and the list goes on. But despite the effort of this multibillion-dollar diet industry, chronic disease trends clearly convey that we are not winning the battle against poor health. 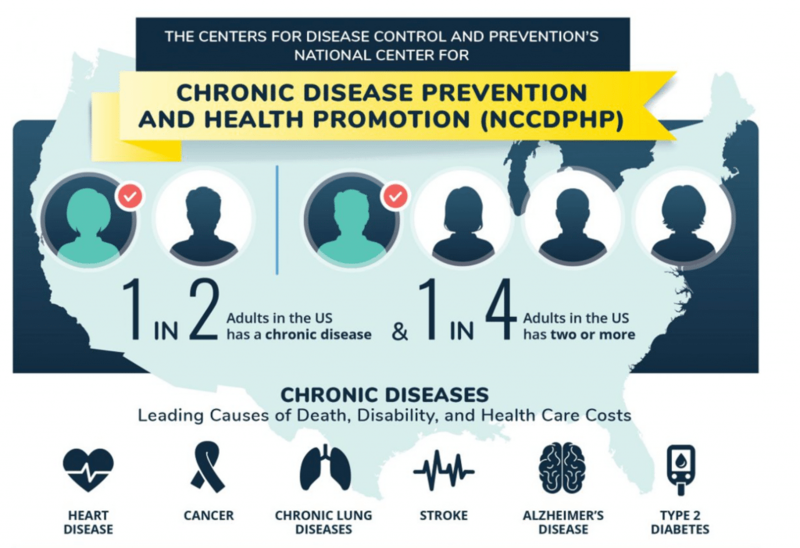 USA chronic disease statistics are very concerning, an estimated 50% of US adults battle at least one chronic health condition, and approximately 25% have two or more. The Info graphic from the Centers for Disease Control (CDC) and prevention says it all. The prevalence of diabetes in 2012, was 29.1 million Americans, or 9.3% of the population. It is estimated that 1.4 million Americans are diagnosed with diabetes every year. In 2012, 86 million Americans age 20 and older had prediabetes; this is up from 79 million in 2010. It is blatantly clear that we are facing a national pandemic of chronic disease, and “band-aid” solutions of “drink this”, “combine that” or “avoid this” for a short period in your life where you manage to tolerate the inconvenience of ridged dietary rules, will not combat the pandemic of ill health we are all facing. You may be thinking – this won’t happen to me, surely if I follow the 10 day “detox” plan my sister gave me, or the raw food diet I read about in my favorite magazine I will rid my body of toxins and I will be free then to eat and drink what I like and escape the consequences of poor food choices at least for the next year or two. Right? Wrong! This will not work, current trends show us that intermintent efforts do not produce lasting results, there is no instant cure for poor lifestyle choices and no simple antidote. We all need to learn how to manage our food and lifestyle choices on a daily basis to promote optimal health and reduce disease risk. It will be your adotption of healthy habits and an improvement in the overall “quality” of your diet (food intake) that will make all the difference. “Diet quality” refers to ensuring the best possible intake of nutrients from a variety of foods within your appropriate daily Calorie requirement, and maintaining your intake of these nutrients on a daily basis. To keep you motivated and in pursuit of a better quality diet, think of this; poor quality food choices (low in nutritional value – such as fast foods and refined and sugary foods) ignite processes within the cells of your body that will fast track you to disease. While a diet rich in nutrients including vitamins, minerals, ant-oxidants and ant-inflammatory molecules tend to suppress these processes and help to maintain good health. To use an analogy; consider poor food choices are similar to spraying gasoline onto a smoldering fire, which in turn sets the fire ablaze, while a nutrient rich diet is like spraying water onto smoldering coals that suppress the flames reducing your disease risk and/or helping to slow the progression of an existing condition. In other words, the detrimental process that is triggered by poor quality dietary choices is suppressed by a high quality diet. To keep the entire process at bay and reduce our risk, we need to choose a quality diet each and every day, not simply for a moment when we are motivated by short-term goals. Many diets fail, because we do not understand that the solutions to lifestyle associated diseases and obesity are not found in medications or “quick-fix” solutions, and are not dismantled by ridged dietary rules that can only be maintained in the short term. If you intend to make a difference to your health and your weight, it is time to draw a line and say this far and no farther. No more fads, no more ridged unrealistic rules that can only be maintained in the short term. Desperate times do require solutions of a significant magnitude, and adopting high “quality diet”, within an appropriate calorie intake, balanced against regular exercise and maintained consistently, will be a lifestyle solution “extraordinaire”. The results will last a lifetime, promote longevity, a lower body weight and help to prevent disease. It is time to dump FAD diets, nourish yourself and escape your risk for developing a chronic disease. Eat 5 – 9 servings of fresh fruit and vegetables daily. Give preference to deeply colored (purple, red, orange, dark green) fruit and vegetables, which are rich in antioxidants and phytonutrients. Include fatty fish (rich in Omega-3 fatty acids DHA and EPA), such as sardines, salmon, mackerel into your diet at least twice a week. Incorporate more nuts, seeds, olive oil and avocado into your regular diet. These foods contain desirable forms of unsaturated fat as well as useful vitamins. minerals and antioxidants. Make water your beverage of choice – it contains no calories – yet keeps you hydrated. Dump the fast foods and foods high in fat (cream laden dishes, deep fried foods, fatty cuts of meat, sausage, loads of cheese, creamy sauces)– they too set processes in motion that promote disease. Rediscover whole-grain foods, such as Barley, sorghum, brown rice, millet, steel cut oats, quinoa, spelt, corn on the cob and freshly popped popcorn (not commercial varieties). These foods also contain phytonutrients, antioxidants and fiber to stave off the consequences of modern day living. Alcohol: do not binge drink, and if you do drink alcohol do so in moderation, not more than 1 drink per day for women and 2 drinks per day for men. For the added boost of resveratrol (a phytonutrient and antioxidant) choose red wine over other alcoholic beverages. For women who are at risk for breast cancer try to avoid alcohol all together. Do not quit – if you intend to be well and stay well, you need to be in hot pursuit of the optimal diet each and every day that does not mean you will never deviate – it just means you never give up striving for optimal nourishment from a quality diet. Get back on track as soon as possible. Shop, cook and entertain in accordance with your commitment to diet quality, and encourage your friends and family to do the same.